I don't know about your kids, but mine have each been a fan of Dinosaur Roar! by Paul Stickland for some time now. They love the stomping, the squishing, the meekness and the strength of those dinosaurs. We recently received a set of new releases from Sterling Children's Books which included a series of books featuring these same dinosaurs. Each of these focus on a different topic, the titles being rather self-explanatory. Each one boasts those same familiar and lovable dinosaurs that Stickland created and are very reasonably priced to boot! If you have a little dinosaur lover in your midst and you are working on any of these concepts, then I'd not hesitate in recommending them to you. 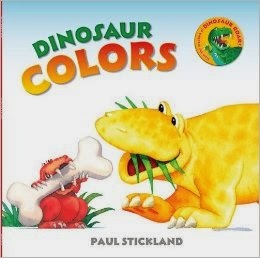 Dinosaur Colors includes colors red, yellow, orange, blue, purple, pink, brown and green. 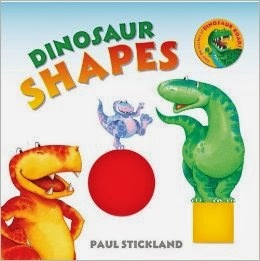 Dinosaur Shapes includes the following shapes: square, circle, triangle, rectangle, oval, diamond, star and heart. 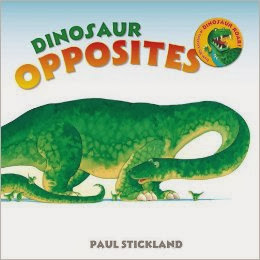 Each page in this title shows a picture of the shape on one side of the page and the opposite side features dinosaurs in and around the same shape. Questions are posed such as, "How many circles are there?" or "How many points do these stars have?" Dinosaur Opposites is the most reminiscent of the original title in this series, Dinosaurs Roar! The illustrations are the same in this book as they were in the original. Short/long, weak/strong, above/below, etc. If you have the original title I wouldn't think you would need to purchase this one as it mimics. 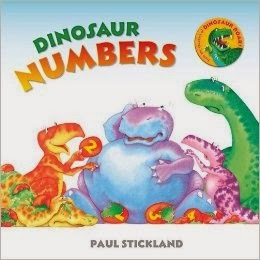 Dinosaur Numbers is told in rhyme. "One big dinosaur standing all alone. Two hungry dinosaurs biting on some bones." Out of the four books above, all three of my kids were most attracted to the numbers book because it has a loose story attached to it and it made for enjoyable reading. However, they liked the illustrations in each of the books! We were excited to see these books but we're more excited to tell you that Sterling Children's Books has offered to give away a complete set to one of you! Now that's a deal! THIS CONTEST IS NOW CLOSED. THE WINNER, as selected by Random.org, IS #9 - Cassandra! CONGRATS! Ooh, the boy would eat these up! I'm interested! They look like good books. My 15 month old daughter is just getting to the stage where she enjoys having books read to her. I bet my nephew would love a set of these books! He just turned three. My boys would love thee. I like the bright colors of the books. Ah! I have an almost 1 yr old book lover. Bless his heart. My first 2 did not enjoy being read to until 3.5ish. This little guy. Oh boy! These books are so cute, and a really great learning tool. I would love to have them for my little one. Thanks for having the giveaway. I'd love to win these books for my youngest grandson! I know he would love them and it will be a great way for him to learn. Thank you!